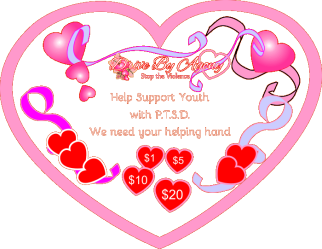 The primary objective of Drive By Agony is to inspire victims of crime to assist young people suffering from the effects of Post-Traumatic Stress Disorder(P.T.S.D.) and to provide programs and counseling for at risk youth and families. Drive By Agony needs your help to provide resources to victims and children suffering from P.T.S.D. We are a charitable nonprofit dedicated to eradicating violence and providing resources for those suffering from its effects. Learn more about our organization, leadership and programs. We help those with post traumatic stress and address its long term effects on children, victims of violence, and those routinely put in harm's way. Share your experiences with P.T.S.D. and violence, get involved, or get in touch with us. Donate to Drive By Agony's P.T.S.D. programs for children. © Drive By Agony 2016. All rights reserved.